on to serve in WW2, long after the J Class boats were scuttled in Port Philip Bay. The submarine base at Neutral Bay in Sydney Harbour is named in its honour. The base was de-commissioned in 1999. 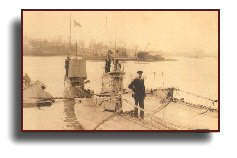 "The old submarines C.1 (Lieut .A.C Newbold) and C.3 (Lieut. R.D. Sandford), each with a volunteer crew of one other officer and four ratings, had five tons of amatol packed into their fore-ends and were to be driven into the viaduct where they were to be blown up to prevent reinforcement of the German garrison on the mole. The Crews were meant to abandon their submarines shortly before the collision, leaving the submarines to steer themselves automatically into the viaduct. During the passage from Dover C.1 [with Harry Coward aboard] parted her tow and consequently arrived too late to take part in the operation." Lieutenant S.A. Bayford, D.S.C., R.N.R. A report to the Admiralty, which I may publish in part on this site at a later date, goes into considerable detail of the actions of submarines C.1 and C.3. The report leaves the reader in no doubt that the Captain of C.3, Lieutenant R. D. Sandford, richly deserved the Victoria Cross which he was awarded on 23rd July 1918. There were 38 C Class Coastal submarines. Harry Coward is buried in Geelong. I recall being told that he rode a motorcycle with sidecar, was chess champion of Geelong, and was a keen model maker. Thanks once more to George Malcolmson of the Royal Navy Submarine Museum for much of the information posted here.